ELLENSBURG, Wash. – Cody Webster understands his position as king of the hill may be for a limited time, but he’s enjoying the view so far. They’ve shown it over the course of this inaugural Bullfighters Only season. It has been an amazing race for the first BFO world championship, and Webster is the third man to hold the top spot in 2016. “Last week made my seventh event, and I’ve won over $20,000,” said Webster of Wayne, Okla. “That speaks volumes for what the BFO has done this year. It would be different if a guy could go to every event. Webster will be one of three men involved in Friday’s Bullfighter’s Only event held in conjunction with the Ellensburg Rodeo, a Labor Day weekend tradition for more than 90 years. He will be joined by Nate Jestes of Douglas, Wyo., and Dusty Tuckness of Meeteetse, Wyo. Jestes has led the BFO standings for much of the season, and Tuckness has posted the highest-marked fight – a 91.5 in Cody, Wyo. “It’s a great race,” Webster said, pointing out that Weston Rutkowski of Haskell, Texas, has also held the top spot and sits No. 3 in the standings with just a few events remaining in the regular season. “It’s set up well for everybody. Weston is more of a freestyle guy than me; he doesn’t have near as many protection jobs, so he’s been able to go to more events. “I’m thrilled for the BFO,” Webster said. “I’m blessed that I have so many protection jobs. At the same time, I was one of those young guys coming up who couldn’t get that many protection jobs. There was a time when I was starting when I had to do good at the freestyle bullfights or go flip burgers. Jestes, Tuckness and Webster will first serve as protection bullfighters during the rodeo, then they will be part of the Bullfighters Only competition. 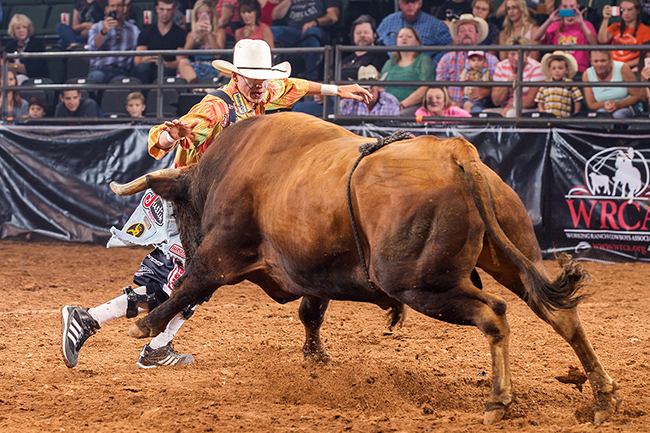 With scores based on a 100-point scale, men can earn up to 50 points per fight based on their ability to exhibit control and style while maneuvering around or over an animal; a bull can earn up to 50 points based on its quickness, aggression and willingness to stay with the bullfighter. “Not only will we show up and protect the cowboys, but we also get to step up for the freestyle fight,” Webster said. Being part of the Ellensburg Rodeo also is a big step for Bullfighters Only as it continues to grow freestyle bullfighting through some of the most prestigious rodeos in the country. “It’s huge,” he said. “It’s freestyle bullfighting. It’s extreme, it’s very much contact and it’s very wild. It’s also very dangerous.